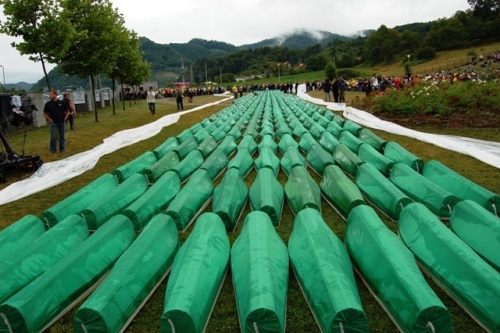 “Today marks the 14th Anniversary of the massacre at Srebrenica, part of the Bosnian Genocide which claimed hundreds of thousands of lives between 1992 and 1995. Srebrenica had been categorized by the United Nations as a ‘safe area’ so it was guarded by only a minimal force. Due in large part to this, General Ratko Mladić and his Army of the Republika Srpska had no trouble taking the town. The women, seniors, and children, were quickly loaded onto buses and sent away to Tuzla, a town nearby that had suffered through a massacre of its own only a few weeks earlier, and at the hands of the same troops. This left about ten thousand Bosniaks remaining in the town, all of them males, and all of whom were promptly exterminated.